Let's talk about pleasant surprises. The Hippo is the Southern New Hampshire regional equivalent of the Boston Phoenix in our area; they keep up with reporting about creative endeavors; film and art and music and shows and gallery openings, etc. Hippo has a yearly "Best Of" issue that comes out usually every March. Readers write in their favorite local businesses; theaters, restaurants, personalities, etc. 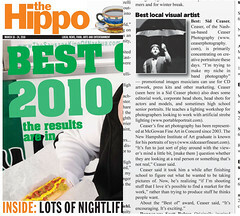 Imagine my surprise when I got a call last week congratulating me on being the 2010 recipient of "Best Visual Artist" by The Hippo and its readers. Its very flattering. I'm usually the one that is photographing the winners of the Best Of issue, and I never expected to actually be a recipient. The exciting thing about this is that all the votes are by readers. People took the time to write my name in the category, and that is a very, very cool thing. I've really been trying the last few years to get my work noticed; from trying to work with local magazines to teaching my Portable Portrait workshop, to producing new fine art work that is represented by McGowan Fine Art. I've been actively posting and sharing everything I do through Facebook and Twitter. I've been hosting casual photographer "strobist"meetups here are the studio. I've even started hosting photography workshops by other photographers here at my studio. I've enjoyed making videos of previous shoots and meetups, and my buddy Dave Seah and I even try to do a Podcast on a regular schedule. I host a networking event every few months for a group of like-minded creative individuals to help comment, critique and motivate each other. I have developed a beautiful relationship with Studio 99 - a local music venue/listening room that is bringing insurmountable talent to the Nashua area. I get so excited by what I am trying to do as a profession that I feel compelled to share it with everyone. And I think people are starting to notice. I hope its because they feel the quality of work is at a professional level. I hope its because they enjoy seeing my images and reading my silly exploits about chocolate-covered bacon and 50cc scooters and lighting workshops and photo shoots and half-naked toy images. But this kind of an award; a regional award that tells everyone in Southern New Hampshire that, gosh darn it, people *do* like me, and they *do* like my work - well, that makes me think I'm doing something right. If you are one of the people that wrote my name down on the line this year - thank you. I'm trying really hard to follow my dreams, and positive reinforcement is the foundation that shows me I'm on the right track. If you are someone visiting my website for the first time because maybe you saw me in the Hippo; Hi! 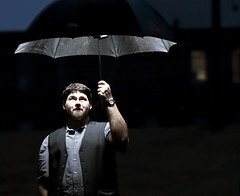 I'm a creative portrait photographer here in Nashua. Check out my fine art work. Check out my commercial work. Take a peek at some of my behind-the-scenes videos. Check out my Podcast, and stalk me on all the various social media sites out there. I can make your band look awesome. I can make you look fantastic. Need a head shot? Let's talk. In this dragging economy, receiving the 2010 Best Visual Artist award is a fantastic way to ring in the year. Thanks to everyone for their support. To read the whole list, click here and be on the lookout for the glossy Best of 2010 Magazine coming soon!